Springtime is here! Apparently it brings out the Carrie Bradshaw in me. All that’s missing is a giant corsage. This is such a super cute combination of colors and patterns. Adore that fiery skirt! I adore your blouse! Your style is very Carrie in this post! We're all dotted with blossoms leaves here too in SF, it's so magical. I wish these trees would keep blooming all year long – it would make everything better! Also want to say how lovely your outfit is, such a great combination of colors. Or a huge peacock feather hat! This is definitely a favorite of mine! I love the skirt and top, and cardi too! Def Carrie Bradshaw. Totally Bradshaw m'dear! I love your pretty pleated skirt and that great floral top with the bow. 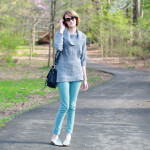 Great look for spring! those pleats are so DREAMY! and the eclectic mix of things here is just wonderful! Am trying to find cute pleated skirts and dresses for myself recently. Love that pleated skirt, that coral is beautiful. your pleated skirt is stunning! I love that this feels both classy and flirty – and the petal covered sidewalk feels like the perfect catwalk. Fairy tale Spring <3 You look so beautiful! I just love this blouse -and the pleated skirt is beyond fab! You look so pretty! I love the color of that skirt and your top is so sweet! WOW! You have beautiful pictures. What camera do you use. Love this look, the orange skirt is gorgeous. Love all the petals! Beautiful outfit, especially the colors! Love the floral top and yes you do look fantastic and very Carrie! What a pretty pleated skirt! Love the fire(ish) orange! I love this outfit! The pleated skirt is so pretty. this look is absolute perfection! possibly one of my favorites ever! Love the colours and prints! And that bow, how pretty is that! the blouse is so beautiful with the poppy red skirt! love this! This is so ridiculously copy-able! (Can I? Please?) And oh, btw, the last shot is just genius. Love this outfit the colours just work together so well! Beautiful! Beautiful colorssss! Love the look.